When I think of the phrase “Sales Promotion” my mind instantly shifts to Starbucks Coffee Company. As a former barista who managed every store promotion at my store, it seemed almost every other week we were launching a new product or promotion. Aside from the required daily sampling of new pastries and beverages, we were almost always advertising for in store giveaways and discounts. I cannot count the number of t-shirts in my closet I still have from working there- whether they were to promote “Frappy (or Happy) Hour”, VIA® Instant Coffee, Refreshers™, new or seasonal coffee beans such as the Tribute Anniversary Blend™, “Buy One Get One Free Holiday Drinks”, “Treat Receipts”, the Gold Card Rewards system (encouragement of repeat purchase)- the list goes on. Starbucks does marketing differently from their competitors. While the company was founded in 1971, their first advertising campaign on television took place in 2007. Television advertisement is not a primary focus for the company’s marketing strategy, as Starbucks “does not stress about aggressive advertising in order to win customer sales”. Instead they utilize sales promotion, which is “less expensive and more controllable, to push immediate turnovers”. Through sales promotions, Starbucks is able to build a strong brand loyalty among their consumers because they are able to give them a short-term incentive, which motivates them to purchase Starbucks products immediately. Currently, Starbucks is promoting their cold beverage line of drinks through the “Treat Receipt” campaign. 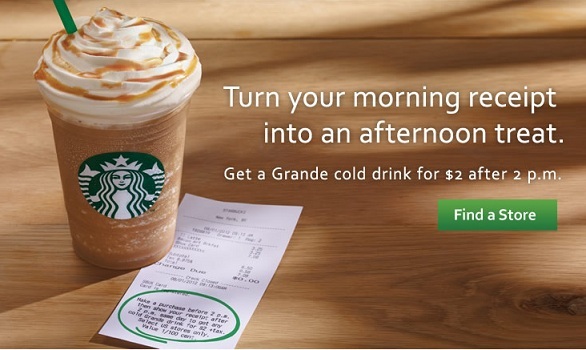 Through this campaign, customers are encouraged to come back after 2pm with the receipt from their morning coffee in order to receive any grande sized beverage for only $2, no matter how special the customization of the drink is- stimulating trial purchase. (Typically extra shots and soy milk are an additional fee.) The “Treat Receipt” brings back the same traffic from the morning crowd and allows the consumer to try something they normally wouldn’t purchase at a discounted price. CEO Howard Schultz stated that the company does not believe that brand sustainability can be achieved through only advertising and sales promotion, however, and that the key is to build a personal relationship with each customer. Nevertheless, this marketing strategy has led the company to its current success. This video commercial launched in the U.K. exemplifies perfectly the Starbucks strategy of integrating sales promotion and building individual customer relationships.